I feel like I post on this topic more than almost anything else, but until the truth is readily known, I feel it’s my obligation to let the world know how badly government and industries (like the replacement window industry) are lying to not just homeowners, but also architects and contractors. If you care about spreading the truth about preservation, then share this post as much as possible. Writing about the how-to’s of preservation usually has very little to do with current events, but this week I have felt overwhelmed by news reports about preservation related ridiculousness. Here are a few items that have recently gotten my hackles up. 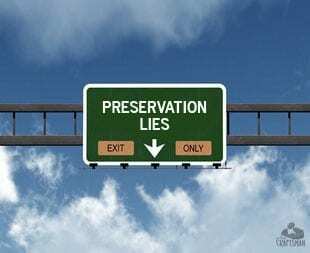 We have got to stop these preservation lies from being presented as fact. 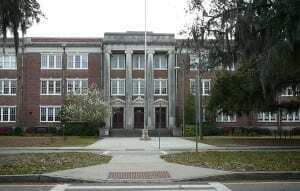 I saw a report recently about how the Savannah Public School Board voted (unanimously!) to replace all 913 original windows at the historic Savannah Arts Academy. Their decision to replace all the windows was based on a cost comparison study the district did to see what their two options (restoration vs replacement) would cost over 25 years. The study is absolutely ludicrous! The numbers look to me (and other professionals I have surveyed) to have been purposely skewed to encourage replacement over restoration. The figures are not based in reality. Other restorers have had similar responses wondering where the woefully biased numbers came from. Really? It sounds like she has already made up her mind. I think that it is more financially responsible to maintain your wood windows so they don’t get to the point where falling glass is endangering students. Going years with no kind of maintenance is what caused this “emergency” need to replace the windows. Local preservationists are being cast as unfeeling snobs who care more about saving old windows than about the safety of the students, which is absolutely absurd. Winter Park, FL Mayor Steve Leary recently sought to fill three vacancies in the city’s historic preservation board but was blocked by City Commissioners Tom McMacken and Carolyn Cooper. The commissioners were hesitant to bring in new members while the board was 18 months into revamping the city’s historic preservation ordinance, which has fallen under much scrutiny from residents after the historic Capen House nearly fell to the wrecking ball back in 2013. Winter Park has some of the richest history in Central Florida, but it has by far the leanest preservation protections across the state. It’s far too easy to tear things down in Winter Park. “I’m not sure I want to change my pitcher in the ninth inning,” Commissioner Tom McMacken said. While I wasn’t sure which side of this move I came down on, after a little research, it became abundantly clear that the Mayor has no clue about what a historic preservation board does. His choices for appointments comprised of three people who know little about historic preservation and whose interests lie more in the redevelopment of the area rather than the preservation of the city’s history. Case in point Phil Kean, an award winning local architect who was one of the appointees, is an immensely talented architect, but his appointment seems a direct front to preservation, since his company is responsible for demolishing several older homes in the area to build new custom homes. His own page on Houzz declares him to, “Specialize in creating one-of-a-kind, custom, luxury residences that represent today’s priorities…leading edge technology.” Hardly sounds like someone interested in preservation. And the other two candidates had little to no experience in historic preservation either. The truth? Historic Preservation encourages economic growth and funnels more money into the local area than redevelopment in almost all cases. You can read the studies below if you don’t believe me. There are too many preservation lies going around today and these are just two of the ones that came across my radar this week. Don’t be fooled by politicians or anyone else telling you preserving our local treasures isn’t important. Remember, it’s not good because it old, it’s old because it’s good! Man modern is as modern does. Have any of you heard of Silica Fume- It’s a material that used to the correct amounts in cements and asphalts helps disperse electricity. Modern buildings seem to incorporate it because they don’t used lightning rods to disperse energy. Metal roofs are dispersers also. For buildings that do or should have lightning rods there is a great green ability to absorb energy-solar or thermal. Building absorption grids or nets could possibly act as energy builders, making older buildings more energy efficient. Mr. Ripkin’s words in the 3rd link above lacked a very important point for all of us. My Grandmother’s 150 year old house with a totally straight roof line and antique windows MAY cost $100,000 to totally rejuvenate properly. But a new build on that exact same property is likely to coat $175,000 AND last for maybe 40 years. Hmm true value with maintenance and care can’t be replaced by new values. Is Bob Yapp still active? I checked his site and the most recent posts seem to be 2012 – as it was the last time I checked it. Bob is still working in the field though It doesn’t appear he posts on the blog much anymore. Bob’s website isn’t updated often, but he’s active. I participated in a two day, hands-on, window restoration workshop led by him last month. He did tell me he’s working to get all episodes of “About Your House” up for streaming online. He owns all of the rights in the show. Something else regarding the outrageous numbers presented – they are bent on spending the money and getting it over with. They could put the money they want to spend on replacing the windows into an interest earning account and earn enough interest to pay a crew year round to maintain not only the windows, but the whole building. And we’re talking good, living wages here, putting money back into the community rather than into some corporation’s coffers. Who does the government serve here? The community? Or the ones who line their pockets? I suspect the latter. Good point. Preservation has been proven to create more jobs with the same amount of investment. I have seen similar short-sighted thinking in my town, and it is almost impossible to convince folks that there are other options. We used to build to last several lifetimes, and now we use materials that will barely make it to 20 or 30 years. I worry that these fine old buildings will be eventually undone by these supposed improvements when the improvements fail. Yes, there are far to few people like you around who really understand old buildings. I must admit that I get more purist as I learn more about them and their virtues are underappreciated. But even magazines like “Old House Journal” are ditching preservation for the more lucrative market of the “new old house,” and massive additions to bring old buildings “up to modern living standards.” Not that I think additions are horrible, or that people with new houses can’t appreciate vintage style, but I wish there was more appreciation of the integrity of old buildings and original materials, not just the outward appearance of shiny modern approximations. Very few can afford the craftsmanship and quality of materials in many old houses if they were to build new, and can’t see beyond dirt and neglect to see the inherent quality, even in modest buildings.